I have carefully watched how the link URL display in beta versions of Firefox 4 changed through time. First, it was like we were used from Firefox 3.6: it was a part of the status bar at the bottom of the screen and it was displayed when the user hoovered over the link. 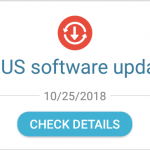 Later, around beta7, it changed. There was no more status bar and the link display was moved to the address bar. When a user hoovered over a link the link destination was shown right to the current page address in the address (URL) bar. 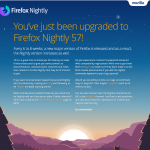 This was not very useful, because the link was shortened and even if Mozilla used some algorithms to display the most relevant part of the link it didn’t really work. Many people, including me, started to install add-ons like Status-4-Evar or Firefox 4 UI Fixer. They solved the problem to some degree, but this still wasn’t a very elegant solution. The newer beta versions of Firefox 4 (like beta13pre) bring another solution to this. The link destination URL is now either shown in status bar nor in address bar – it’s shown in the content of the web page. Just above the status bar on the left side a new line of text appears with a white background and in a length of a link URL and it contains the URL. This feature is most similar to how Google Chrome shows links – it’s basically the same. There is, however, one interesting behaviour. If your mouse cursor is on the left and the new line of text with URL would be covered with the cursor, then the URL is displayed on the right side of the content instead on the default left side. I have changed it to zero (‘0’) and this feature now works as expected. I like it, so I have disabled all add-ons that have changed the default behaviours of URL link display. As I’ve read this feature isn’t supposed to change any more and will stay this way for the final Firefox 4.